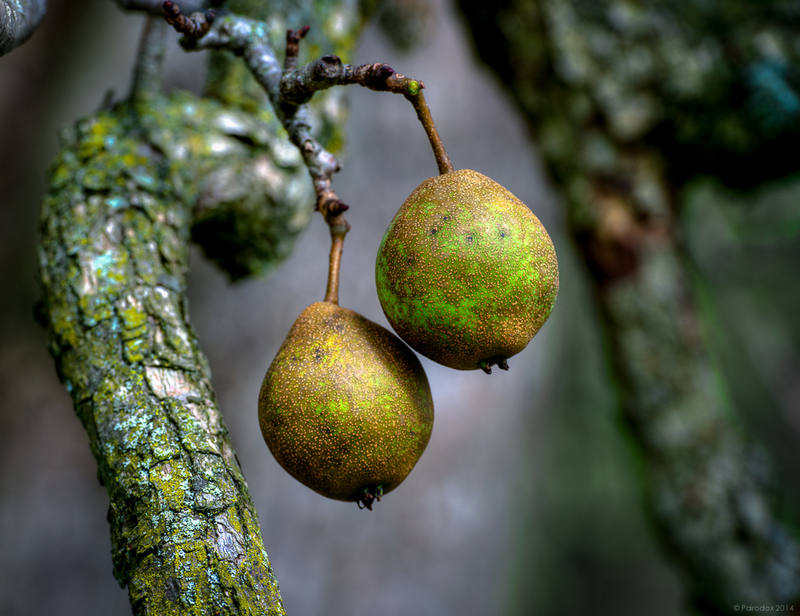 We’ve got several pear trees on the farm and the two oldest have very heavy fruit set this year. We had a peach tree that was similarly prolific and collapsed under its own weight. The ripening pears shown here are covered with what looks like a bit of rust, fungus; our apples are gnarly and nearly all sport one or a few holes, evidence of insect oviposition to provide newly hatched larvae a ready supply of nutrients. We could easily spray our trees with any of a variety of fungicides and pesticides but we do not, for a couple of reasons. First, we worry about chemical residues on the fruit that we eat and preserve. And second, although the matter has yet to be settled incontrovertibly, there is increasing evidence that fungicides and especially pesticides, most notably those called neonicotinoids, may contribute to Colony Collapse Disorder (CCD) which effects honey bees across the country and around the world. Honey bees are critically important pollinators of fruit and nut crops and it has been estimated that they are responsible for more than $15 billion in increased crop value each year here in the United States. That number increases by an order-of-magnitude when one considers potential global declines in crop productivity due to losses from CCD. The primary symptom of CCD is the nearly complete abandonment of hives by adult bees. What’s been so puzzling about this is that symptomatic hives have a live queen, plenty of capped brood (developing young), and lots of honey and pollen. Workers simply disappear. Where they go, nobody knows. Research to discover the cause or synergistic causes of CCD has been intensive. Possible primary culprits are fungal infection, mite parasitism, viral infection, immunosupression, and the toxic influences of both fungicides and pesticides. Several recent studies have shed light on the relationship between exposure to neonicotinoids (neuro-active insecticides like Imidacloprid and Clothianidin) and declines in managed bee populations. Based upon the strength of such studies the Canadian government announced a partial two-year ban on neonicotinoid pesticides in 2014. The year before the European Union adopted a two-year restriction on the use of neonicotinoids. There is a petition at Change.org which calls upon the Canadian government to ban these substances, outright. Here in the states beekeepers have allied with the Pesticide Action Network to petition the U.S. Environmental Protection Agency to suspend registration of neonicotinoids. To distill yet another of my very lengthy preambles, we have never sprayed our fruit trees, ever. Nearly all of our apples are scabby, the pears are scaly, and the peaches never, ever, look like anything you would want to pick from a supermarket shelf. If any particular piece of fruit is too-far-gone, we simply toss it for the deer and other visitors to the farm. Anything with a blemish or two, or three, finds its way to the kitchen where we have lots of very sharp knives. There are few imperfections which cannot be removed with a quick flick of the wrist. We do not care to produce pretty fruit, but we do care about the potential effects of toxins which would be released into the environment if we were to spray. In particular we worry about honey bees and the relationship between environmental toxins and CCD. We really do, and so should you. Is the cosmetic appeal of the fruits you purchase and consume really worth it?